The Leprosy Mission India Trust donates money to MESH each year for us to help artisans meet the cost of travel to meet buyers, for training etc. 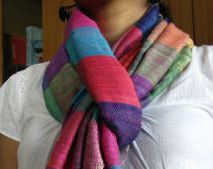 So in December 2011 MESH was glad to be able to help with the travel costs for two people from Little Flower Leprosy Colony in Bihar who went way up into Assam to look for a source of Endi silk cocoons for the silk scarves that they weave in the colony. The results have been exciting. They have found a supplier but much more exciting is their findings and the nature of the supplier. This is what Kabita writes The place where we got the cocoon is in the villages of Assam, where a government program is being managed to increase the income of poorest women through endi culture. The endicultuture is the silk that does not have to kill its larva to get thread. In other types of silk, you have to kill the insect. Therefore it is called "ahimsa silk" meaning non violent cocoon. The quality of this cocoon is that it looks like cotton, and is warm like wool. The organisation, Eri Silkworm Production Center, is a government body and provides eggs to women to raise the insect and harvest the cocoon. But think about these scarves for a minute, wonderful silk, something straight from nature, nothing harmful or harming about it, indeed the making of this scarf has involved the gentle hands of poor women trying to improve the lives of their families, the swift hands of more women as they spin the silk in a leprosy community on the border with Nepal and then the strong arms of men and women from the same community as they weave the threads into the scarf. The woven scarf is then fringed by the women as they earn for their families and community. Is it any wonder that such a scarf feels so good? It is a very good scarf in all possible ways.